When you paddle your Wavewalk in waves without covering the front end of its cockpit, some spray may get inside, especially if you paddle through big surf. The water is drained to the bottom of the hulls, and it flows backwards to the rear part of the hull tips. Altogether, this is rather insignificant. When you drive a motorized Wavewalk in the ocean for a long time, at high speed and through waves, your boat generates more spray, and breaking waves can result in more water getting into the cockpit. A Spray Shield works to minimize intake from the front, but not from the sides. Some water may accumulate on the bottom of the hulls, at the rear end of the boat. A few gallons of water would be unnoticed, but having effective means to remove any amount of water at any time is highly recommended, simply because stuff happens, and you’d better be well prepared for any case. Many motorboats and sailing boats feature one-way valves at the rear end of their hulls. When the boat moves in the water at high speed, the low pressure behind its stern causes the valve to open, and pulls out the water that accumulated at the bottom of the hull, namely the bilge. A hull outfitted with such a valve is called ‘self bailing’. Needless to say that SOT kayaks described by their manufacturers as “self bailing” are not, and the misuse of this term is misleading. Unlike big motorboats, a Wavewalk can be dragged on the ground and over rocks, and this might damage the valves. One-way valves can get jammed, and since the Wavewalk often goes in shallow water that’s mixed with sand and mud, and where vegetation can be abundant, the possibility of such malfunction cannot be disregarded. Some small outboard gas motors (e.g. Tohatsu, starting at 4 HP) offer the option to add an alternator (electric current generator) and an AC to DC converter. Thus, the motor continuously produces an electric current that can charge a battery that would power an electric bilge pump and/or an electric trolling motor. This solution sounds perfect – just press or turn an electric switch, and bail the water out. And if you get an automatic pump, you don’t even have to remember to activate it. Cost – The combined cost of an alternator and converter is around $450. The cost of a battery and an electric bilge pump would bring the total cost of this solution to over $500. It may not be a prohibitive price, but it’s still a considerable sum in the context of a Wavewalk boat. Vulnerability – Keeping a battery and electric pump somewhere in your Wavewalk may not be enough, and you’d need to secure both, so that in case of an accident they would remain inside the cockpit and be fully operational when needed the most. This could prove to be somehow hard to achieve. An electric bilge pump powered by a battery that isn’t being continuously charged makes sense, because unlike propelling the boat, pumping a few gallons of water out of its hulls require little power. The downside of this simple solution is having to remember to charge the battery before each motorized trip offshore, and the possibility that in case of an accident the system could stop working. Simply a square bucket with a handle (or without one) that fits into a Wavewalk hull, and used as a bilge bucket. It works, but only in case there is a lot of water in the hull, namely that the water is deep enough, and the user faces the water. But such a scenario is extremely unlikely, and in a typical case only a small quantity of water may accumulate at the bottom of the rear end of the hulls, that is far behind the driver. 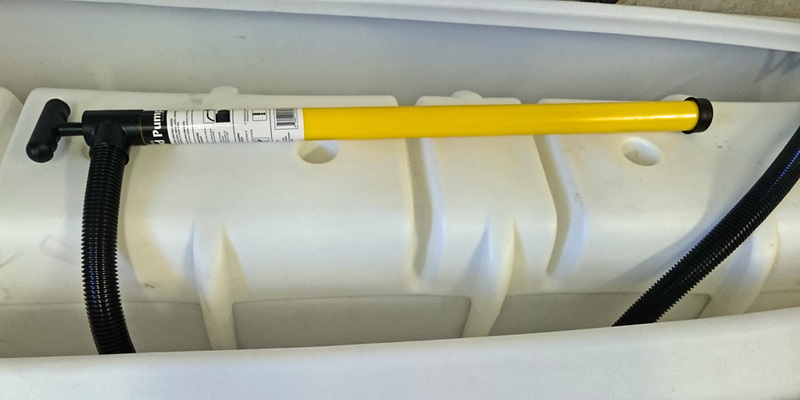 A 36″ long, lightweight hand pump costs $29 at Lowe’s. It allows to pump water from the rear end of the hulls while the user sits facing forward. This is a major advantage, ergonomically speaking, and in simple terms of convenience. The pump provides a sturdy, simple, and easy to operate solution that you can count on. The piston is lubricated by the water itself, and this makes pumping easy. Capacity wise, four strokes bail out one gallon, and since it’s hard to imagine having to bail out more than a few gallons at a time, the effort required is almost negligible. The pump features a simple filter at its end, and this prevents it from getting jammed. If there is a perfect solution, we think this is it. Good advice with the manual bilge pump and it stows so conveniently. A towel tucked in each hull tip and a gallon Arizona tea jug with the bottom cut out make a good Plan B & Plan C.
I tuck one on the bottom of each rear hull tip, and they are perfect for absorbing small quantities of water, and for swiping the bottom of the hulls. Also, you can drop the towels over your bare legs as sun protection. I wish I had done that, yesterday. Thanks for the best laugh of the week. Welcome to the Red Knee Tribe. Wet towels can also be used to cool off (around the neck and to wipe forehead). I like to fish barefoot, and rest my feet on towels in each hull to keep them warm and dry in winter. You can grab flopping fish with them, and apply pressure to stop bleeding with them. I’m sure I forgot other possible uses.